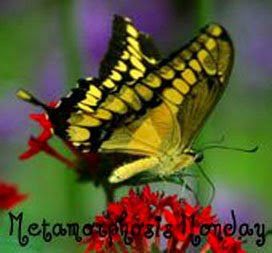 Welcome to Met Monday hosted by Susan at Between Naps on the Porch. It's a great day to show all of the BIG changes that we've made -- inside or outside! Having lived at Linderhof for 21 years our metamorphasis are far and few between. We've done our changing. From the aqua living room to the awful vanity in the bathroom, we've painted and changed and even changed again. But . . . . occasionally, just occasionally, there is something new at Linderhof! A triangle in the garden outside the breakfast room. 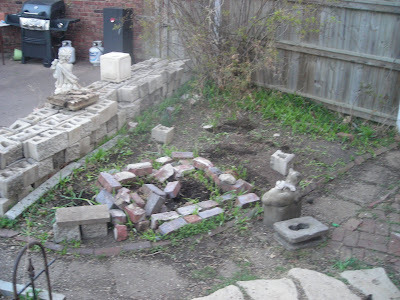 At one time (in the 20's) it was supposedly a rose bed. We put the heated bird bath there this winter for it gave a good view of the birds. But it is not a pretty site. So unpretty, in fact, that the cat even has it's back turned! This is Point A. But a couple of days of work (not by us -- we're not that talented) and we have a pond complete with a happy cat spewing water! It's not too big just 4 x 6 but I can imagine it with some plants and fish darting back and forth -- what whimsy that. Goldfish swimming under the cat! It's stone and concrete which would be the type of pond in the garden of a 1920's house. And we are excited that our ugly triangle has now turned into a useful pond. It is Point B. When I get the landscaping done there will be a Point C and that will be another Met Monday post! I love your little pond! It's about the size of mine. I have two goldfish in it. And probably four plants, which come to overpower it in a few months. But I love the sound of the water flowing when I go outside. You're going to love it! I love the idea of the cat and the fishes together. I too have a triangle to tackle. I'm planning on planting some herbs in it for easy access off the back porch! The pond is fabulous, can't wait to see it landscaped and with pretty fish swimming in it. What a great view you will have from the dining room. Love your pond and I can't wait to see it after you have done the landscaping! It really looks fantastic! I love the pond and the cat fountain. I love your little pond. I have a fountain next to my entry and I have had a terrible time getting the pump to work. I'm gonna have to get Mr. Honey to do something about it. I think I will show him your lovely pond. I love this and have always wanted the sound of running water nearby--alas, I will have to turn on the sprinkler for that :) Thanks! Lovely little pond. Can you hear the water splashing when you're inside? I look forward to seeing the Point C photos. If the door is open, we can hear it from inside -- and that I like very much! I love your new pond, love the cat! Love your pond and the spitting cat! Just kidding! It's adorable! We plan to recreate it when we move back to the states. I love the plants-they are just starting to bloom. The iris are my favorite-didn't know there was a variety that grew in a pond. I love the lily pads too. I plan to post a picture on my blog once everything is in full bloom. How cute is that cat spout?! 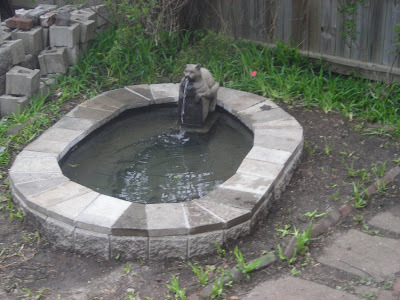 Love your new little pond :-) Looking forward to seeing it after you've done the landscaping -- it's going to look great!! I'd say so -- he's happily spitting water! Love, love, love your pond and how clever, the cat over looking the fish below. Running water is such a soothing sound. I know you are going to enjoy your new pond. I always love to see what you will do with something. My first thought puts me as a visitor to Linderhof - enjoying results of whatever effort you have put forth. This pond is fun - and I can SEE goldfish! Even as I compose my thoughts I can hear the sound of the water! Ohhhh my...what a grand transformation! I love your new fountain and that kitty is just precious! 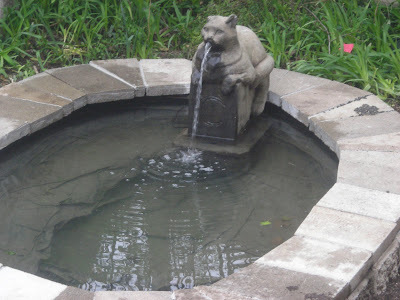 I don't believe that I've ever seen a cat fountain before...so unique and I love it!!! The pond was a marvelous transformation of a difficult spot. Great job! What a cute pond! Yes I can see the fish with the cat - how funny -- but then having had dogs all my life - I can also see a dog laying in the pond in the summer to cool down and the cat "spitting" on him! LOL. Can't wait to see point C.I've always wanted a pond,maybe we'll work on that next spring. What a cute little pond. I will anxiously be waiting for point C, I'll bet it will be amazing. Oh my, how I would love to leave a window or door open and hear the sound of running water. I love the pond & the cat fountain. Very cute with that cat! Your little pond/fountain is really nice. You'll need to post again when you get it all planted. I'm sure this will be a wonderful place for you to view. Wow!! I can only imagine how much more charming it will be with the fish and pretty plants!! Looks lovely!! Thanks for dropping by my blog. I look forward to stopping back to visit you again! Gorgeous! Golfish swimming under the cat would be too funny!